In adults, cardiac disease is not uncommon and the majority of causes of sudden cardiac death are due to atherosclerotic coronary artery disease. However, cardiac death in children is a rare occurrence and the cause differs based on the age of the child. For infants less than one year of age, ductal dependent congenital heart disease is the most common cause, and after the first year and into early adulthood acquired heart conditions, such as myocarditis, cardiomyopathy and aortic dissection in patients with Marfan's syndrome. The objective of this review is to outline cardiac emergencies in the pediatric population and contrast the presentation with adults. The emergency room physician and pediatric intensivist will usually be the first and second lines of care for pediatric cardiac emergencies and thus it is imperative that they have knowledge of the diverse presentations of cardiac disease in order to increase the likelihood of delivering early appropriate therapy and referral. Left-sided obstructive lesions include HLHS, critical aortic stenosis, and coarctation of the aorta represent 12.4% of CHD. 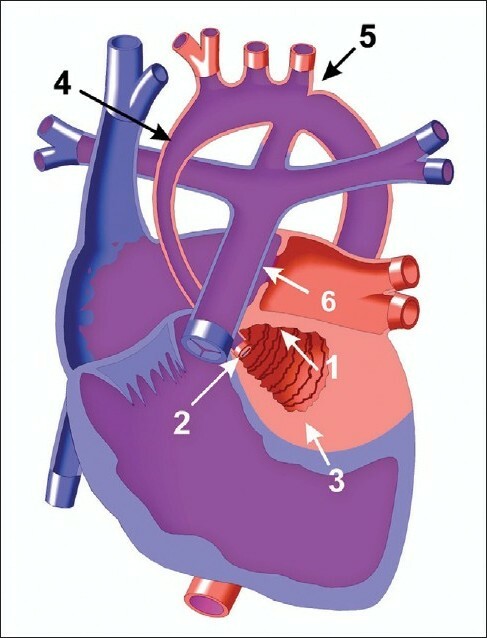 In HLHS for example [Figure 1], as the PDA closes, pulmonary overcirculation develops and systemic hypoperfusion, circulatory collapse and shock ensue. The patient will present with respiratory distress, hepatomegaly, tachycardia, and signs of poor perfusion. Additionally, in critical coarctation of the aorta [Figure 2], femoral pulses are weak or absent and there is a blood pressure differential between the upper and lower extremities reflecting the gradient across the stenotic aortic segment. Prostaglandin infusion is necessary to reopen the PDA and basic resuscitative measures (ABC's) should be initiated. Oxygen therapy can either help or hurt the patient and should be used judiciously, directed by the underlying anatomy and anticipated oxygen saturation for the heart defect. For example, to achieve a pulmonary circulation to systemic circulation flow ratio of 1:1, an oxygen saturation of 75 to 80% maybe desired (such as in HLHS). In this lesion, administration of oxygen to obtain a "normal" saturation of 100% would be detrimental, as the oxygen effect of reduced pulmonary vascular resistance compromises systemic perfusion. Of note, in patients with critical coarctation, blood supply to the lower extremities will be extremely compromised such that an IO in the tibia may not be adequate and a right upper extremity or scalp IV may provide better access until a surgical cut down can be obtained. Right-sided obstructive lesions such as severe tetralogy of Fallot and pulmonary atresia with intact ventricular septum depend on ductal patency to provide blood flow to the pulmonary artery. As the ductus closes, infants develop progressive and rapid cyanosis not improved with oxygen administration and respiratory distress. Prostaglandins should be started immediately to reopen the ductus arteriosus in order to provide pulmonary blood flow through left to right shunting (aorta across the PDA to pulmonary artery), as opposed to the right to left shunt on left-sided obstructive lesions. In these lesions, 100% oxygen is useful to improve pulmonary blood flow and increase dissolved O 2 content. Whereas ductal dependent lesions typically present early after ductal closure within the first two weeks of life, other CHD usually present in four-six weeks after birth when the pulmonary vascular resistance has fallen, such as a large ventricular septal defect. Congestive heart failure (CHF) ensues from the significant left to right shunt and pulmonary congestion. Infants typically present with poor feeding, failure to thrive, tachypnea, and diaphoresis. Symptoms of older children are more typical adult symptoms of decreased exercise tolerance and dyspnea. Of note, dependent edema in children is very difficult to assess and more often a very late finding. Increased jugular venous pressure is difficult to assess in infants secondary to their short necks and liver size is used as a surrogate marker. CHF is usually related to one of the following conditions: anomalous left coronary artery arising from the pulmonary artery (ALCAPA), congenital cardiomyopathy, myocarditis, lesions resulting from a large intracardiac shunt (e.g. 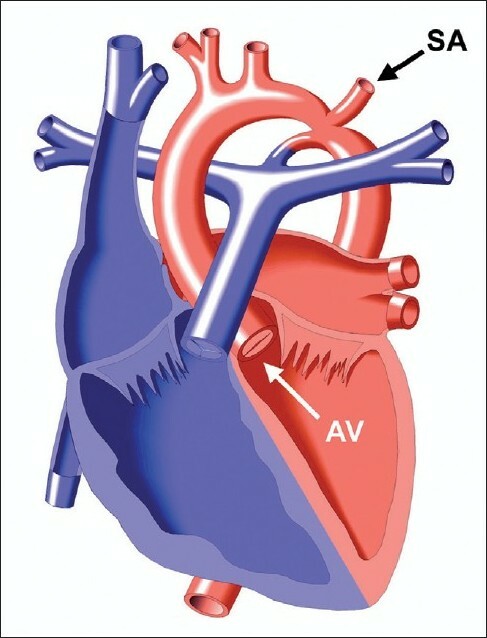 ventricular sepal defect) or extracardiac shunt (vein of Galen malformation), or arrhythmias. ALCAPA [Figure 3] is a type of CHD that typically presents at two to three months of age when pulmonary artery (PA) pressure decreases. ALCAPA is one of the most common causes of myocardial ischemia and infarction in children, specifically anterolateral infarct pattern  [Figure 4] and is associated with high mortality, where 90% of untreated patients die within the first year of life. Infants typically present with episodes of irritability (angina pain) and diaphoresis particularly during feeding (when myocardial oxygen consumption increases), signs of CHF, and a murmur of mitral regurgitation. Although mortality is high without treatment, prompt diagnosis and surgical treatment have excellent results with improvement in myocardial function overtime. Cardiomyopathies are a heterogeneous group of myocardial diseases that causes significant disability and death. They are characterized by inappropriate ventricular hypertrophy or dilatation and are associated with electrical dysfunction or systolic and/or diastolic ventricular dysfunction. Kawasaki disease does not usually present as a critical emergency; however, timely recognition and treatment can prevent the leading cause of acquired heart disease in children in the United States  and fatal cardiac events in adults. Kawasaki disease is an acute vasculitis of unknown cause that predominantly affects children under five years of age. In 15 to 25% of untreated children, coronary artery aneurysms and progressive stenosis develop which can lead to significant morbidity and mortality from ischemic heart disease, myocardial infarction or sudden death. ,, The disease is diagnosed based on clinical criteria of at least five days of fever and at least four of the main clinical features including: polymorphous rash; limbic sparing non exudative conjunctivitis; mucocutaneous changes (e.g. strawberry tongue, dry cracked lips); cervical lymphadenopathy; and extremity changes with acute edema of the hands and feet or palmar erythema and after two to three weeks of illness periungual desquamation of the fingers and toes. There are also other supplemental laboratory and other clinical findings that are characteristic of the disease. Children with a protracted febrile illness greater than five days with two to three of the clinical features of Kawasaki, incomplete Kawasaki should be considered. Moreover, the AHA recommends that an infant less than six months with fever greater than seven days and laboratory signs of systemic inflammation even without clinical features should have an echocardiogram. Mortality is principally due to the cardiac sequelae. During the acute phase of the disease, in addition to coronary arteritis, pericarditis, myocarditis, and valvar heart disease can develop. Myocarditis can lead to myocardial dysfunction and children can present hypotensive and in cardiogenic shock. Arrhythmias can be associated as well as PR prolongation and nonspecific ST and T wave changes noted on electrocardiogram. There are specific guidelines associated with the acute and long-term management of Kawasaki disease. Treatment consist of IVIG 2g/kg over 12 hours and high dose aspirin 80-100 mg/kg/day in 4 doses for 48 to 72 hours after fever defervescence, then low dose 3 to 5 mg/kg/day. Patients with persistent fever (≥ 36 hours after initial IVIG) or recurrent fever should be retreated with IVIG. The long-term management should be tailored based on the degree of coronary artery involvement and the risk for ischemic events. Aortic dissection is rare in infants and children, and is associated with inherited disorders such as Marfan syndrome and other connective tissue disorders, and after balloon dilation of coarctation and re-coarctation, complication of cardiopulmonary bypass at the aortic cannulation site, and in young adults with a bicuspid aortic valve and ascending aortic dilation. , In contrast, atherosclerosis is the main cause of aortic aneurysms and dissection in adults, with hypertension being the main risk factor. The clinical presentation in aortic dissection will vary based on the origin and extension of the dissection. Typically, there is abrupt onset of sharp pain that may change in location, followed by congestive cardiac failure due to severe aortic regurgitation. Patients may present with syncope, cardiac tamponade, stroke, limb ischemia with pulse deficits, paraplegia, and if renal or mesenteric arteries are involved may result in oliguria/anuria or have persistent abdominal pain. A diastolic murmur of aortic regurgitation and the typical wide pulse pressure is present in half of patients with proximal dissection. Aortic rupture into the pericardium with cardiac tamponade (i.e. friction rub, muffled heart sounds, hypotension, jugular venous distention, pulsus paradoxus) or the pleural space are indications for surgical emergencies. 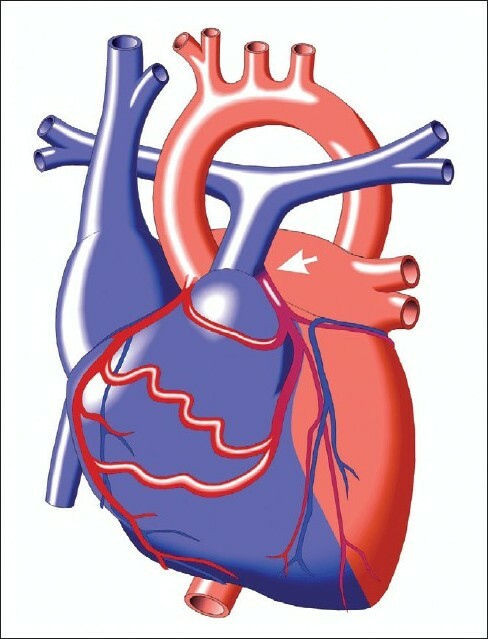 A detailed history and physical exam should be performed; a patient with stigmata of Marfan syndrome or other connective tissue disease would raise the index of suspicion for dissection compared to other possible diagnoses (such as acute coronary syndrome, pericarditis, pulmonary embolism, and cholecystitis). An EKG is important to differentiate acute myocardial infarction to prevent the administration of thrombolytic therapy that would be detrimental in aortic dissection. 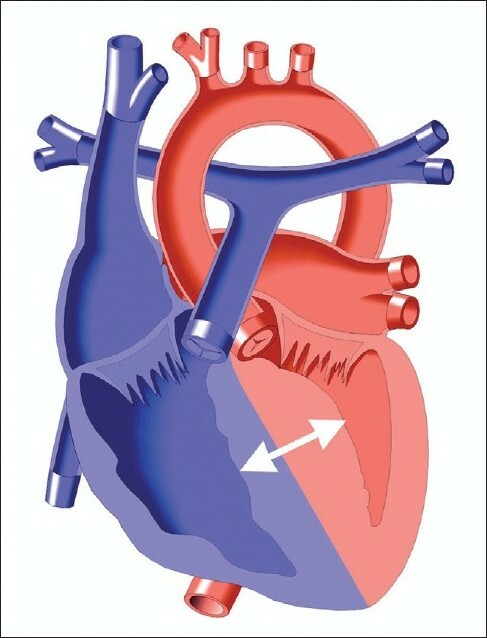 Although, 20% of patients with dissection involving the ascending aorta have evidence of ischemia or infarction as the dissection extends into the coronary ostium, and in this situation, additional imaging studies should be preformed to confirm the dissection if the index of suspicion is high. Diverse imaging modalities can be used to detect aortic dissection. Transthoracic and transesophageal echocardiography can be useful in the emergency room and operating room for emergent decision making. CT scans are the most often used technique in patients with suspected aortic dissection and have a high sensitivity and specificity. Branch vessel involvement can be accurately identified with contrast angiography, and should be used in patients with neurological symptoms, acute renal failure, and limb and mesenteric ischemia. Patients should be in an intensive care unit with blood pressure and heart rate monitoring. Fluid repletion, pain relief (e.g. morphine) and blood pressure lowering drugs, starting with a beta blocker and adding intravenous sodium nitroprusside for severe hypertension are important initial therapies. Surgical management in children is guided by similar principles as adults, with the emphasis on prophylactic intervention in patients with underlying dilation to prevent dissection. The goal of diagnosis and appropriate treatment is to decrease mortality by preventing potentially lethal recurrent large thrombi. Clinical signs, symptoms and laboratory studies are not sensitive or specific to confirm or exclude PE, but should increase the index of suspicion to proceed with additional imaging. Such as, an electrocardiogram may show RV strain (classic S1,Q3,T3, new onset incomplete or complete RBBB), but this finding is not specific to PE and may be present in other causes of RV strain. Diagnostic imaging include venous ultrasonography to detect DVT; echocardiography to detect right heart thrombi, a right to left shunt through a patent foramen ovale (an indication of elevated right sided pressures), and right ventricular dysfunction (RV dilation, hypokinesis, increased velocity of the tricuspid regurgitation jet) findings which were associated with greater than two-fold increased risk of PE-related mortality;  V/Q lung scan is useful when the scan is normal or indicates high probability, but most patients do not have findings that are definitive;  Pulmonary angiography is the gold standard, although it is an invasive specialized technique with associated risks that should be reserved for the small subgroup of patients in whom the diagnosis of PE cannot be made by other non invasive imaging modalities. While there are some similarities in cardiac disease in children and adults, there are some very important differences as well. Clinicians who care for children, even occasionally, should be aware of diseases that are unique to children (i.e. ductal dependent lesions) as well as the clinical presentations that are more unique to children (i.e. colic, sweating with feeds, hepatomegaly, differences in 4 extremity blood pressures, etc…). In addition, they should be aware of some of the approaches to therapy that differ from that of adults with cardiac disease (i.e. prompt administration of prostaglandins in ductal dependent lesions and the need to administer oxygen judiciously in children whose CHD leads to usual saturations of 75 to 85%). Prompt recognition and treatment of cardiac emergencies and consultation of pediatric intensivists and cardiologists in children can lead to improved outcomes. 1. Drory Y, Turetz Y, Hiss Y, Lev B, Fisman EZ, Pines A, Kramer MR. Sudden unexpected death in persons <40 years of age. Am J Cardiol 1991;68:1388-92. 2. Litherthson RR. Sudden death from cardiac causes in children and young adults. N Engl J Med 1996;334:1039-44. 3. Boneva RS, Botto, LD, Moore CA, Yang Q, Correa A, Erickson JD. Mortality associated with congenital heart defects in the United States: trends and racial disparities, 1979-1997. Circulation 2001;103:2376-81. 4. Colletti JE, Homme JL, Woodridge DP. Unsuspected neonatal killers in emergency medicine. Emerg Med Clin North Am 2004;22:929-60. 5. Schamberger MS. Cardiac Emergencies in Children. Pediatr Ann 1996;25:339-44. 6. Massin MM, Malekzadeh-Milani SG, Van Aerschot I, Dessy H. Management of cardiac emergencies in children. Minerva Pediatr 2009;61:163-73. 7. Park MK. Pediatric Cardiology for Practitioners. 5 th ed. Missouri: Mosby; 2008. p. 62-4,314-5. 8. Moodie DS, Fyfe D, Gill CC, Cook SA, Lytle BW, Taylor PA, et al. Anomalous origin of the left coronary artery from the pulmonary artery (Bland-White-Garland syndrome) in adult patients: long term follow up after surgery. Am Heart J 1983;106:381-8. 9. Alexi-Meskishvilla V, Berger F, Weng Y, Lange PE, Hetzer R. Anomalous origin of the left coronary artery from the pulmonary artery in adults. J Card Surg 1995;10:309-15. 10. Selzman CH, Zimmerman MA, Campbell DN. ALCAPA in an adult with preserved left ventricular function. J Card Surg 2003;18:25-8. 11. Towbin JA, Lowe AM, Colan SD, Sleeper, LA, Orav EJ, Clunie S, et al. Incidence, Causes, and Outcomes of Dilated Cardiomyopathy in Children. JAMA 2006;296:1867-76. 12. Chang Y, Chao, H, Hsia S, Yan D. Myocarditis presenting as gastritis in children. Pediatr Emerg Care 2006;22:439-40. 13. 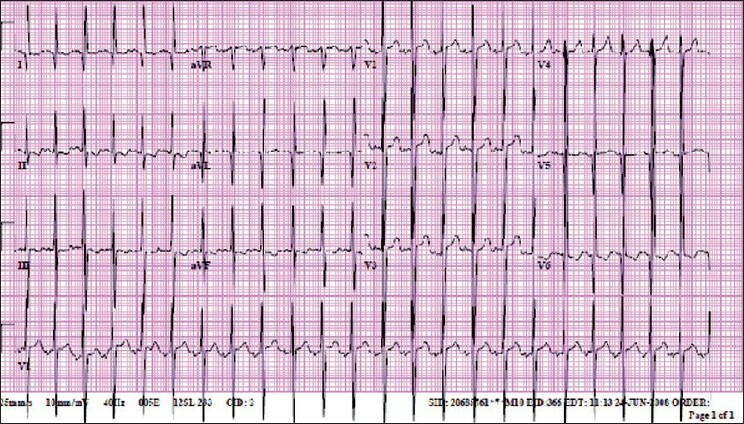 Freedman SB, Haladyn JK, Floh A, Kirsh JA, Taylor G. Thull-Freedman J. Pediatric myocarditis: emergency department clinical findings and diagnostic evaluation. Pediatrics 2007;120:1278-85. 14. Mahrholdt H, Wagner A, Deluigi CC, Kispert E, Hager S, Meinhardt G, et al. Presentation, patterns of myocardial damage, and clinical course of viral myocarditis. Circulation 2006;114:1581-90. 15. Hufnagel G, Pankuweit S, Richter A, Schonian U, Maisch B. The European Study of Epidemiology and Treatment of Cardiac Inflammatory Diseases (ESETCID): First Epidemiological Results. Herz 2000;25:279-85. 16. Johnsrude CL, Perry JC, Cecchin F, Smith EO, Fraley K, Friedman RA, et al. Differentiating anomalous left main coronary artery from the pulmonary artery in infants from myocarditis and dilated cardiomyopathy by electrogram. Am J Cardiol 1995;75:71-4. 17. Amabile N, Fraisse A, Bouvenot J, Chetaille P, Ovaert C. Outcome of acute fulminant myocarditis in children. Heart 2006;92:1269-73. 18. Chau EM, Chow W, Chiu CS, Wang E. Treatment and outcome of biopsy-proven fulminant myocarditis in adults. Int J Cardiol 2006;110:405-6. 19. Gupta S, Markman DW, Drazner MH, Mammen P. Fulminant myocarditis. Nat Clin Pract Cardiovasc Med 2008;5:693-706. 20. McCarthy RE, Boehmer JP, Hruban RH, Hutchins GM, Kasper EK, Hare JM, et al. Long-term Outcome of Fulminant Myocarditis as Compared with Acute (Nonfulminant) Myocarditis. N Engl J Med 2000;342:690-5. 21. Cooper LT. Myocarditis. N Engl J Med 2009;360:1526-38. 22. Towbin JA, Lowe AM, Colan SD. Incidence, causes, and outcomes of dilated cardiomyopathy in children. JAMA 2006;296:1867-76. 23. Kapser EK, Agema W, Hutchins GM, Deckers JW, Hare JM, Baughman KL. The causes of dilated cardiomyopathy: a clinicopathologic review of 673 consecutive patients. J Am Coll Cardiol 1994;23:586-90. 24. Codd MB, Sugrue DD, Gersh BJ, Melton LJ. Epidemiology of idiopathic dilated and hypertrophic cardiomyopathy: A population-based study in Olmsted County, Minnesota, 1975-1984. Circulation 1989;80:564-72. 25. Kantor PF, Mertens LL. Clinical practice: Heart failure in children. Part I: clinical evaluation, diagnostics testing, and initial medical management. Eur J Pediatr 2010;169:269-79. 26. Towbin JA, Bowles NE. The failing heart. Nature 2002;415:227-33. 27. Monserrat L, Elliott PM, Gimeno JR, Sharma S, Penas-Lado M, McKenna WJ. Non-sustained ventricular tachycardia in hypertrophic cardiomyopathy: an in dependent marker of sudden death in young patients. J Am Coll Cardiol 2003;42:873-9. 28. Maron BJ, Fananapazir L. Sudden cardiac death in hypertrophic cardiomyopathy. Circulation 1992;85:I-57-I-63. 29. Maron BJ, McKenna WJ, Danielson GK, Kappenberger LJ, Kuhn HJ, Seidman CE, et al. American College of Cardiology/European Society of Cardiology Expert Consensus Document on Hypertrophic Cardiomyopathy: A Report of the American College of Cardiology Foundation Task Force on Clinical Expert Consensus Documents and the European Society of Cardiology Committee for Practice Guidelines. J Am Coll Cardiol 2003;42:1687-713. 30. Decker JA, Rossano JW, O'Brian Smith E, Cannon B, Clunie SK, Gates C, et al. Risk factors and mode of death in isolated hypertrophic cardiomyopathy in children. J Am Coll Cardiol 2009;54:250-4. 31. Caglar S, Leffler S. Prevalence of life-threatening arrhythmias in ED patients transported to the radiology suite while monitored by telemetry. Am J Emerg Med 2006;24:655-7. 32. Hoffmam TM, Wernovsky G, Wieand TS, Cohen MI, Jennings AC, Vetter VL, et al. The Incidence of Arrhythmias in a Pediatric Cardiac Intensive Care Unit. Ped Cardiol 2002;23:598-604. 33. Samson RA, Atkins DL. Tachyarrhythmias and defibrillation. Pediatr Clin North Am 2008;55:887-907. 34. Doniger SJ, Sharieff GQ. Pediatric dysrrhythmias. Pediatr Clin North Am 2006;53:85-105. 35. Manole MD, Saladino RA. Emergency department management of the pediatric patient with supraventricular tachycardia. Pediatr Emerg Care 2007;23:176-85. 36. Nadkarni VM, Larkin GL, Peberdy MA, Carey SM, Kaye W, Mancini ME, et al. First documented rhythm and clinical outcome from in-hospital cardiac arrest among children and adults. JAMA 2006;295:50-7. 37. Atkins DL, Everson-Stewart S, Sears GK, Daya M, Osmond MH, Warden CR, et al. Epidemiology and outcomes from out-of-hospital cardiac arrest in children: the resuscitation outcomes consortium epistry cardiac arrest. Circulation 2009;119:1484-91. 38. Tester DJ, Ackerman MJ. Cardiomyopathic and channelopathic causes of sudden unexplained death in infants and children. Annu Rev Med 2009;60:69-84. 39. Silva J, Van Hare G. Management of postoperative pediatric cardiac arrhythmias: current state of the art. Curr Treat Options Cardiovasc Med 2009;11:410-6. 40. Santinelli V, Radinovic A, Manguso F, Vicedomini G, Gulletta S, Paglino G, et al. The natural history of asymptomatic ventricular pre-excitation: a long-term prospective follow-up study of 184 asymptomatic children. J Am Coll Cardiol 2009;53:275-80. 41. Topjian AA, Nadkarni VM, Berg RA. Cardiopulmonary resuscitation in children. Curr Opin Crit Care 2009;15:203-8. 42. Chan PS, Krumholz HM, Nichol G, Nallamothu BK; American Heart Association National Registry of Cardiopulmonary Resuscitation Investigators. Delayed time to defibrillation after in-hospital cardiac arrest. N Engl J Med 2008;358:9-17. 43. Valenzuela TD, Roe DJ, Nichol G, Clark LL, Spaite DW, Hardman RG. Outcome of rapid defibrillation by security officers after cardiac arrest in casinos. N Engl J Med 2000;343:1206-9. 44. ECC Committee, Subcommittees and Task Forces of the American Heart Association. 2005 American Heart Association Guidelines for Cardiopulmonary Resuscitation and Emergency Cardiovascular Care. Part 12: Pediatric advanced life support. Circulation 2005;112:IV-167-87. 45. Newburger JW, Takahashi M, Gerber MA, Gewitz MH, Tani LY, Burns JC, et al. Diagnosis, treatment, and long-term management of Kawasaki disease: a statement for health professionals From the Committee on Rheumatic Fever, Endocarditis, and Kawasaki Disease, Council on Cardiovascular Disease in the Young, American Heart Association. Circulation 2004;110:2747-71. 46. Wood LE, Tulloh RM. Kawasaki disease in children. Heart 2009;95:787-92. 47. Tsuda E, Arakaki Y, Sakaguchi H, Yoshimura S, Yazaki S, Echigo S. Changes in causes of sudden deaths by decade in patients with coronary arterial lesions due to Kawasaki disease. Cardiol Young 2005;15:481-8. 48. Burns JC, Shike H, Gordon JB, Malhotra A, Schoenwetter M, Kawasaki T. Sequelae of Kawasaki Disease in Adolescents and Young Adults. J Am Coll Cardiol 1996;28:253-7. 49. Smith BA, Grider DJ. Sudden death in a young adult: Sequelae of childhood Kawasaki disease. Am J Emerg Med 1993;11:381-3. 50. Erbel R, Alfonso F, Boileau C, Dirsch O, Eber B, Haverich A, et al. Diagnosis and management of aortic dissection: Recommendations of the Task Force on Aortic Dissection, European Society of Cardiology. Eur Heart J 2001;22:1642-81. 51. Januzzi JL, Isselbacher EM, Fattori R, Cooper JV, Smith DE, Fang J, et al. Characterizing the Young Patient with Aortic Dissection: Results From the International Registry of Aortic Dissection (IRAD). J Am Coll Cardiol 2004;43:665-9. 52. Johnson A, Bolte R. Pulmonary embolism in the pediatric patient. Pediatr Emerg Care 2004;20:555-63. 53. Berstein D, Coupey S, Schonberg K. Pulmonary embolism in adolescents. Am J Dis Child 1986;140:667-71. 54. Torbicki A, Perrier A, Konstantinides S, Agnelli G, Galie N, Pruszczyk P, et al. Guidelines on the diagnosis and management of acute pulmonary embolism. The Task force for the Diagnosis and Management of Acute Pulmonary Embolism of the European Society of Cardiology (ESC). Eur Heart J 2008;29:2276-315. 55. Fedullo PF, Tapson VF. The evaluation of suspected pulmonary embolism. N Engl J Med 2003;349:1247-56. 56. Van Ommen CH, Peters M. Acute pulmonary embolism in childhood. Thromb Res 2006;118:13-25.